Do you sometimes feel that life passes you by and everyone else is having a whale of a time? Friends tell you about their latest adventure holiday to the Amazon jungle, while you are feeling like a boring fart, because you are content with a tub of ice cream in front of the telly. Perhaps you’re wondering, if you are living life to the full like the others seem to do, and if you should finally pull up your socks and embark on a trek across the desert on a camel. living life to the full isn’t about climbing the highest mountain or swimming with sharks to feel the thrill. It also doesn't mean you have to go out every weekend and get drunk. Not everyone is made to live an extreme lifestyle, and many people, who are constantly on the go and “out there” often have issues they are trying to ignore or running away from. Living life to the full means focusing on your personal potential rather than comparing your life with that of other people. It means pushing yourself a little every day to avoid getting stuck in a comfort zone that stops you from growing and evolving. It means to start each day with the commitment to live without fear of uncomfortable situations or people; plucking up the courage to try something new, take a risk and face situations that you’d rather avoid but know you need to tackle. Living life to the full also means living in the present and mindfully experiencing each moment. Learning to live like the Fool, who is happy-go-lucky enjoying his journey without care in the world, will help you do just that. He welcomes a new beginning with open arms, and yet each new beginning follows an ending. The Fool has learned to detach from old habits, an old situation and is moving into uncharted territory. It is said that only fools live life to the full, because it is only them, who go where most of us fear to go, and they do what many of us tend to avoid. It is fools, who break out of their comfort zones without wondering about consequences. They take risks, take any failures in their stride, but along the way they also reap the rewards. "Living on the edge is perilous, but the view is breath-taking." Again, this isn’t about engaging in high-octane activities or immigrating to the other side of the world (unless you feel extremely passionate about these things rather than just trying to prove something to others). Instead, challenge yourself to conquer your own fears, evasions and negative self-talk by pushing yourself even just a little bit every day. Face those challenging situations and difficult people with the mind of the Fool. Stick with it and you will soon realize that it is exhilarating to overcome your own obstacles, which tend to linger in our minds. It takes courage to challenge our inner obstacles and doing so is certainly not "foolish". 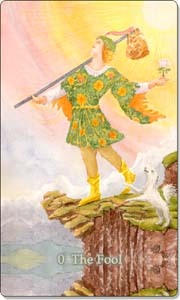 The Fool in the Tarot is associated with Air, the element of intellect, logic, reason and communication. Often the Fool indicates what may be going on in someone's mind rather than referring to action, such as having a strong urge to start afresh. Before action can take place, the mind needs to be ready for it without inhibitions. So next time you wonder, if you live life to the full even though you're not travelling the world or embark on adrenaline-fuelled activities, explore how you can challenge your fears and evasions with the help of a Fool's mind. Recognize your small conquests and achievements every day, and soon you will know that you live life to the full. What challenges have you recently been facing? In the past, what situation did you try to avoid but tackled anyway? 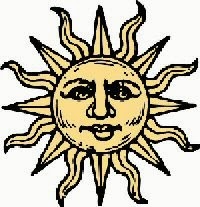 How do you feel the Fool's positive energies can help with current issues you need to resolve? The Tarot isn't just about fortune-telling; you can use the cards to get to know yourself better and explore your strengths and weaknesses to improve the way you engage with people and situations. Let the Tarot empower you and help you live life to the full; check out the Cosmic Faery Tarot Guidebook.